The Wheelhouse and Searchlight could not only be “pushed” down by hand, but this could have been just an assist. 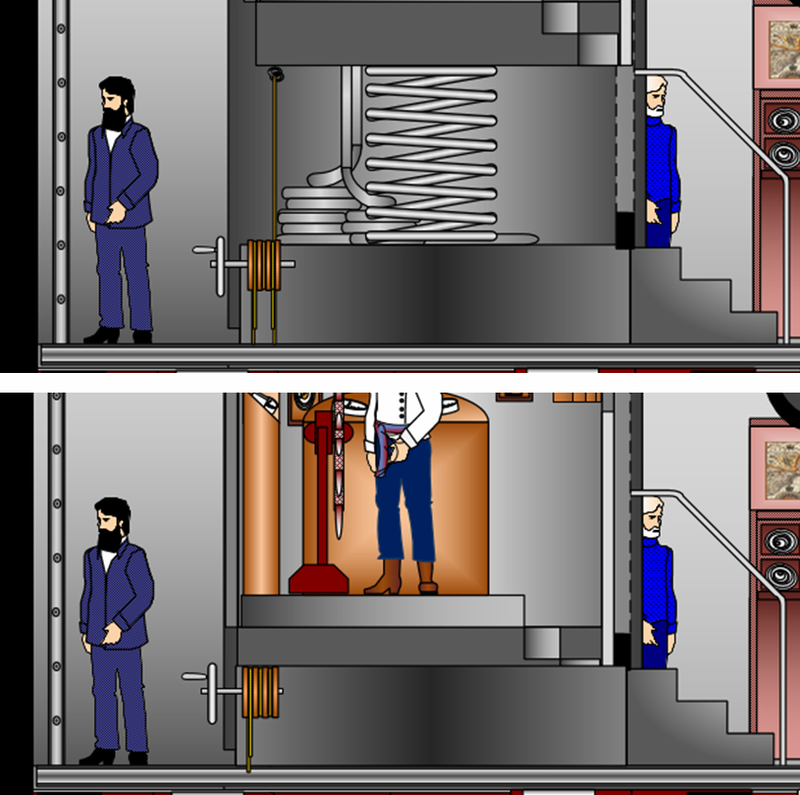 Both were extended while deeply submerged, drawing down may possibly be done by the hand crank, and the water pressure would have kept them down against the spring when retracted. Due to the “Pushing Down” reference on the Wheelhouse, I elected to use a very simple method. I have the structure resting on a heavy duty, industrial size spring, readily available in 1869. The spring pushes the Wheelhouse up while a large block & tackle, also readily available, draws down and holds the structure in the lowered position. This may also be applicable to raising it when submerged. The crew on deck helping with a push, makes the retraction smoother and easier. Once retracted, the structure is held down with a simple clamp, and external pressure. All in all, the process is ‘Nemo’ simplistic, using few parts and is easily worked by the crew. Leaving the Forward Hatch open during this process would also allow the crew to easily coordinate it all. Inserting large pins through holes in interior walls, then into the Wheelhouse and Searchlight bases, would hold each in place while either extended or retracted. Again, I’m trying to apply 1869 technology simplicity. Nemo tells Aronnax; “Behind his cage (Helmsman), I have placed a powerful electric reflector, the rays of which can light up the sea for half a mile ahead. The Light Reflector reference caused me to use an 1800’s lighthouse principal for my design. 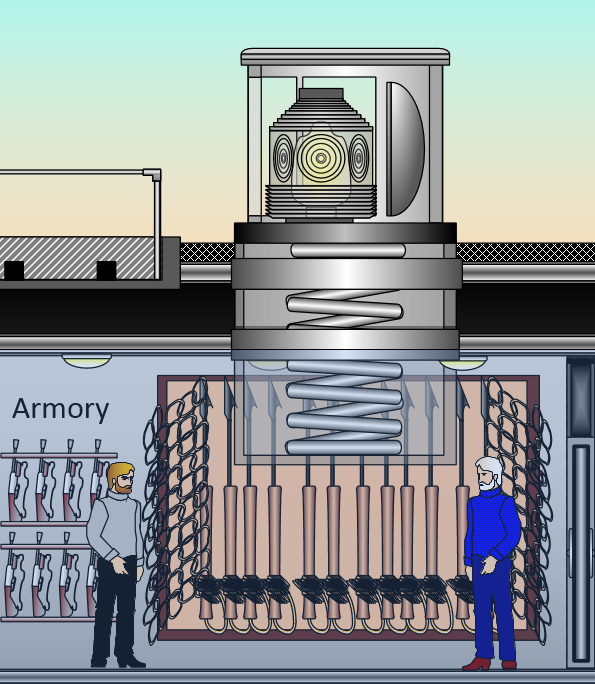 This concept easily applies to all of Verne’s references as well as to my use of the cylinder and the lenticular glass. The “reflector” is often called a “searchlight“. This makes my use of the 1800’s lighthouse concept even more appropriate, including making it round like the Wheelhouse. From the essence of the text, Nemo even used it in that fashion; swinging it around to point in whatever direction he needed. I made the external glass panels on the Searchlight cage standard glass similar to the Wheelhouse for strength when under great pressure while submerged and/or raised. 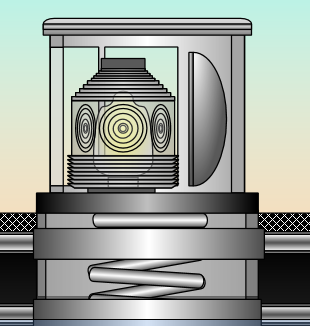 The actual lenses on the light itself were the lenticular type used on lighthouses for the strong magnification, but inappropriate for clear sight such as needed on the Wheelhouse. Ch 14: The Salon window panels were opened and closed remotely. From where? If Nemo operated this function, was he in his cabin? The Wheelhouse? He’s not with the three companions in the Salon. I prefer to think of him in the Wheelhouse or even the Chart Room nearby, not so close to the Salon as his cabin right next door. The control could be anywhere, but references are made to such controls in the Wheelhouse. Aronnax: “Suddenly through two oblong openings, light broke into each side of the Salon. The liquid medium outside was vividly lit up by the electric beam atop the Nautilus.” This was not possible! 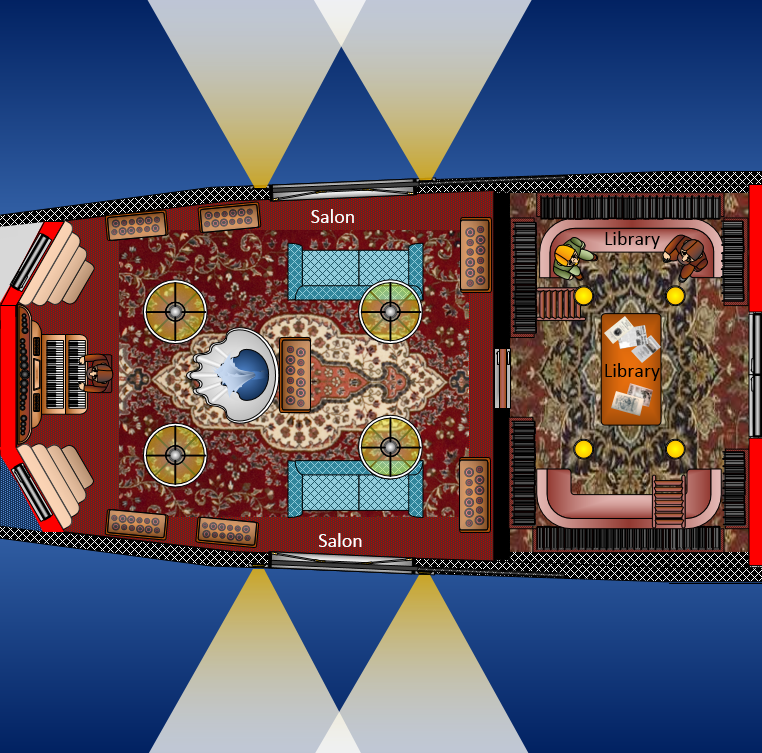 The Salon windows were below the boat’s center-line so under the curve of the hull, as well as below twelve feet of water, and, were 65 feet from a light located in the top center of the hull. Basically, the whole height of the boat was in the way of the Searchlight. This is why I added the external Salon window lights. “Distinctly visible for a mile all around the Nautilus.” A modern light of this type is visible for 50 feet with 150 watts, 120 volts 2 Amps. With 5,280 feet in a mile, somewhere near 15,850 watts would be needed to light the sea as Verne describes. 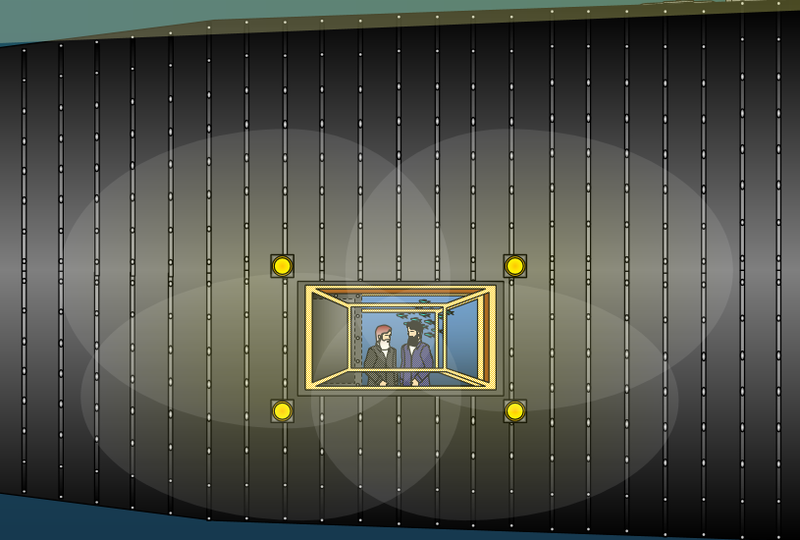 Note: I also added the curtain on the Wheelhouse rear window to help block the very powerful beam from the Searchlight. (See above) Piloting from within this enclosure would be more difficult with that light behind you. (Imagine high beams in your rear-view mirror while driving) The Searchlight would be turned on when on the surface at night and often when submerged while the Wheelhouse was still raised. In Second Part Ch 11 “The Sargasso Sea”; “Outside our panels (Salon)…the waters were bright with the electric light, distributed that not a shadow, not a gradation was visible. The sun itself could not have provided better conditions.” The topside mounted Searchlight could not do this. I placed four powerful lights around each Salon window panel, one at each corner. These external floods should display the sea as Verne described. The Salon windows were below the ships center-line. So if a ship approached while the Salon windows were open, unless the external light were on, there would be no Salon light seen at the surface. Turning on these external Salon light may be the cause of sailor remarks about the “phosphorescent light” seen by surface vessels before ramming. Although Disney depicted lights being visible when ramming, this would not be in agreement with any Verne description. With the Wheelhouse & Searchlight retracted, and no Salon lights with the panels closed, there would be no light visible for battle. However, Nemo may have used the external Salon lights as a fear factor. Note: I placed the retractable panels covering the Salon windows on the inside of the glass. Any mechanism mounted on the hull surface to move these panels would have been another hindrance to retaining that smooth, uninterrupted hull surface for ramming that Nemo wanted. Nothing can protrude above the hull surface or it may get ripped off in battle! Ch 22 : “At last we were able to make out the ships lights.” ( On returning from the underwater funeral ) What lights? There were no lights we know of in the diving chamber, now filled with water awaiting their return. Is he speaking of the Searchlight? The Wheelhouse light? I doubt either would have been in use while resting on the bottom. Since anyone who might be wishing to view out the Salon windows was already outside, the Salon panels were most likely closed. I like to think that the First Mate may have turned on my external Salon lights to help guide them back.